BEIJING (Reuters) - China said on Tuesday it will set an absolute cap on its CO2 emissions from 2016 just a day after the United States announced new targets for its power sector, signalling a potential breakthrough in tough U.N. climate talks. Progress in global climate negotiations has often been held back by a deep split between rich and poor nations, led by the United States and China, respectively, over who should step up their game to reduce emissions. But the fact that the two biggest emitters of greenhouse gases made unprecedented announcements on climate within 24 hours of each other sparked optimism among observers hoping to see the decades-old deadlock broken. The steps come ahead of a global meet on climate change starting on Wednesday in Germany. China, the world's biggest emitter, will set a total cap on its CO2 emissions when its next five-year plan comes into force in 2016, He Jiankun, chairman of China's Advisory Committee on Climate Change, told a conference in Beijing. "The Chinese announcement marks potentially the most important turning point in the global scene on climate change for a decade," said Michael Grubb, a professor of international energy and climate policy at University College London. The announcement comes a day after the United States, the world's second-biggest emitter, for the first time announced plans to rein in carbon emissions from its power sector, a move the Obama administration hopes can inject ambition into the slow-moving international climate negotiations. "The China-US one is a key trust relationship (in climate talks) and if they are rising above that it sends a very powerful signal to the rest of the world to get serious," said John Connor, CEO of Melbourne-based The Climate Institute. "Interesting hint from Beijing, although the key point will be where (the cap) is set. If ambitious and announced well in advance of Paris, it could be a game changer," said a spokesman for EU Climate Action Commissioner Connie Hedegaard. Despite the absolute cap on CO2, adviser He said China's greenhouse gas emissions would only peak in 2030, at around 11 billion tonnes of CO2-equivalent. Its emissions currently stand at around 7-9.5 billion tonnes. But He said that would depend on China achieving a real reduction in coal consumption from sometime around 2020 or 2025, and on the nation meeting its target of having 150-200 gigawatts of nuclear power capacity by 2030. 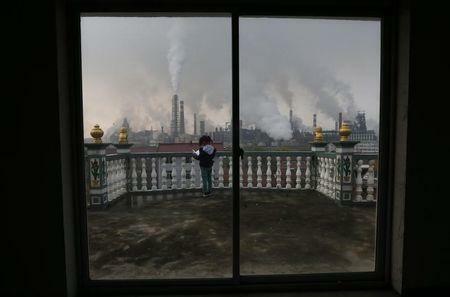 The share of non-fossil fuels in China's energy mix would reach 20 to 25 percent in 2030, He added.